Selection of the type of compressor is too wide, and at least two alternatives should be considered before making a final choice. Productivity of the compressor can be published in the form of tables or graphs and figures. 10.3 and will be for condensing pressure sensor. Similar curves for input voltage and current (in amperes), as a rule, will be provided. Restrictions on use-also usually denied. 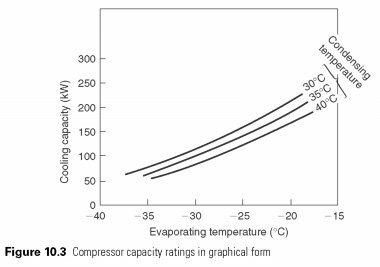 Compressor data, shall be indicated the heat and cold stress the link and it should comply with standard vapor compression cycle, as defined in the European Standard EN12900. Standard hypothermia is equal to zero. Several overheating options are given in the standard, and they are designed to provide the conditions close to normal operating conditions of the compressor. Less compressors can be calculated on a permanent return temperature of the suction gas, which is used for remote installation, where the gas temperature is expected to decelerate on the way to the compressor. Ammonia compressors with the capacity of 5 K overheating corresponding to the flooded evaporator applications. The reasons of these differences, to minimize any errors that occur due to overheating fix. Data should be adjusted to the actual superheat, sub-cooling and any non-useful heat pick-up. The superheat can affect the volumetric efficiency and big changes, changes, based on the change in the density of the gas may not be enough. Correction of hypothermia, is quite simple and enthalpy ratio, which can be done with a P-h chart or computer. If there is a significant difference in pressure between the compressor and condenser or evaporator, they may also be considered.